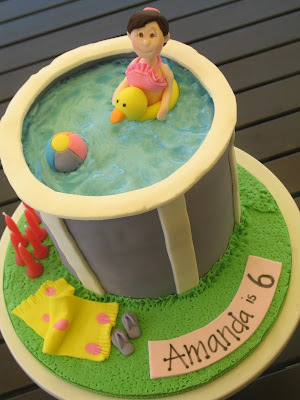 Blissfully Sweet: A Swimming Pool cake for a dear little Amanda! A Swimming Pool cake for a dear little Amanda! A friend's daughters birthday was coming up and a few days before her birthday we caught up and Amanda decided to whisper to me with big teddy bear eyes, that she would love for me to make her a birthday cake! With those eyes and some time to spare (NOT!) how could I say no? So a very quick and easy swimming pool cake was assembled. 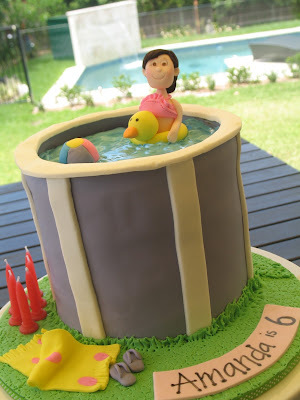 I decided to make it an old fashioned type pool, as I am an old fashioned kind of gal! What better backdrop for a quick photo than my own pool?! Love this Jacki! Pls cd you tell me how you did the water? Thanks a million!